Note**** This is a US post, but this weed IS present in Nova Scotia and the Halifax area... beware!! THURSDAY, July 7 (HealthDay News) -- Call it the import that nobody wants. Experts are urging residents of several states to beware of the "giant hogweed," a tall plant native to Central Asia with umbrella-size flowers containing toxic sap that can cause burns, blisters and, in some cases, even blindness. "Avoid it at all cost," Jodi Holt, a professor of plant physiology at University of California, Riverside, toldABC News. "The sap causes something called phytophotodermatitis when it touches humans," causing scars and potentially blindness if it comes into contact with the eyes, Holt said. Some cases of blindness occurred after children used the hollow stalks as telescopes. 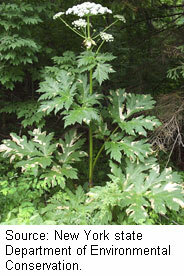 Heracleum Mantegazzianum, as hogweed is botanically known, is already a concern in the Northeast and spreading fast. Patches of giant hogweed have also been sighted in the Pacific Northwest. With white blossoms a foot or larger in diameter, giant hogweed towers up to 15 feet tall and thrives in wet, cool places. It is often spotted near homes, roadways, railroad beds and streams, ABC News said. Crews in several states, including New York, have been charged with seeking out and destroying the invasive species. New York has also set up a giant hogweed hotline -- 845-256-3111-- for people to identify sightings. Typically, large quantities of herbicides are needed to vanquish the plant when found in large patches. Smaller patches can be controlled by hand-cutting the roots, according to published reports. Giant hogweed has been found and destroyed in three counties of Vermont -- Bennington, Washington and Windsor, state plant pathologists reported. And officials in Washington, D.C., are asking residents to be on the lookout for giant hogweed so they can weed out the botanical terrorist, according to news reports. According to the New York state Department of Environmental Conservation, reactions can occur within 15 minutes when skin contact occurs in conjunction with sunlight. The sap contains a photosensitizing chemical that accelerates sun damage and can result in a serious sunburn. Perspiration can increase the reaction, officials said. If you spot giant hogweed, don't try to remove it yourself, experts said. Instead, report the sighting to your state or local department of invasive species control. "The importance of learning what the plant looks like cannot be overstated," Holt told ABC News. The U.S. Department of Agriculture has put the giant hogweed near the top of its Federal Noxious Weed list. The agency said the plant has been reported in Connecticut, Maine, Maryland, Massachusetts, Michigan, New York, New Hampshire, Ohio, Oregon, Pennsylvania, Washington and Vermont. To learn more about poisonous plants, visit the U.S. Food and Drug Administration. A Testimonial From a Very Happy Patient!